Here are the top hotels for your Vail ski trip! 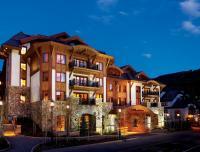 Set 1.1 miles from Betty Ford Alpine Gardens, this upscale chalet-style resort is also 7 miles from EagleVail Golf Club. Traditional rooms come with flat-screen TVs, minifridges, coffeemakers and paid Wi-Fi. Some rooms have pull-out sofas. Studios and suites add kitchenettes, wet bars or private balconies. The resort has a classic gourmet restaurant and a relaxed pub with a fireplace. The resort fee includes use of indoor and outdoor pools, a whirlpool and a fitness center, plus a business center. Activities such as biking, hiking, fly-fishing and snow-skiing are available. Off Interstate 70, this premium ski-in/ski-out hotel in an alpine-style building surrounded by mountains and forest is 2 miles from both the Betty Ford Alpine Gardens, and the shops and galleries of downtown Vail. Chic rooms come with flat-screen TVs and Wi-Fi access; some offer mountain views. Suites add living areas or separate lounges. Upgraded rooms and suites feature fireplaces and/or balconies. Dining options include a modern restaurant/bar, an airy lounge and a relaxed eatery. Other amenities consist of a posh spa, a 24/7 gym and an on-site chairlift. Offering views of the mountains of Arapaho National Forest, this polished hotel off I-70 is in the center of Vale Village and a 9-minute walk from Gondola One station. Refined rooms come with free Wi-Fi, iPod docks, flat-screen TVs and DVD players, plus Nespresso machines and minibars. There's a hip restaurant and a bar, as well as a library and a lobby lounge. Other amenities include an outdoor heated pool and 4 hot tubs with mountain views, along with a spa, a fitness center and a game room.